The Badger Sports Beat | "On Wisconsin"
MADISON, Wis. — Fans of all ages are invited to Camp Randall Stadium for the first-ever Movie Night at Camp Randall on Thursday, Aug. 15. Bring a blanket (but leave your chairs at home) and spread out on the field and enjoy a screening of Remember The Titans on the new giant video board. The selection of Remember The Titans was made by fans earlier this summer through an online vote. Gate 1 of Camp Randall Stadium will open at 6:30 p.m. The feature presentation will begin at 7:15 p.m. Admission is free and open to the public. Families will have the option to sit on the field (space permitting) or in the south end zone stands. Accessible seating will be available. While sealed bottled water can be brought in to the event, no other food or beverages may be carried into Camp Randall Stadium. Limited concessions will be available for purchase. • Only blankets will be allowed on the field. Chairs will not be permitted. • Only bottled water will be permitted on the field. Food and other beverages of any kind may not go on to the field. • Footballs and other balls will not be permitted into the stadium. • In the event of rain or severe weather, the event will be cancelled and will not be rescheduled. MADISON, Wis. – The 2016 Big Ten football season will mark the advent of a nine-game conference schedule for the first time since 1984. On Thursday, the league announced what that conference slate will look like in the first two seasons. Big Ten West Division teams will have four home conference games in 2016 and five home league games in 2017. 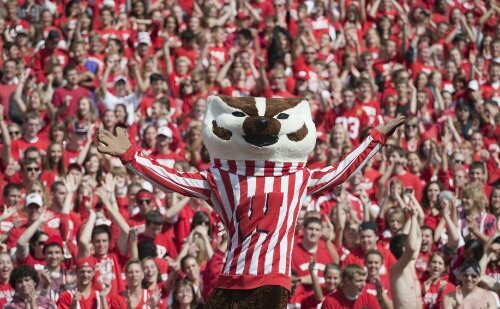 For the Badgers, that means Ohio State, Nebraska, Illinois and Minnesota will visit Camp Randall Stadium in 2016 and Northwestern, Purdue, Maryland, Iowa and Michigan will come to Madison in 2017. In each of 2016 and 2017, Wisconsin and Minnesota will square off on Thanksgiving weekend. That means the Battle for Paul Bunyan’s Axe will close the regular season for both teams every year beginning in 2014. MADISON, Wis. — For the second-consecutive season, Jacob Pedersen has earned a place on the watch list for the John Mackey Award. The Wisconsin senior is among 37 players named to the list of players earning preseason consideration for the award, which is presented annually to the nation’s most outstanding tight end. Pedersen was also on the watch list last season after being named a semifinalist for the award as a sophomore in 2011. This marks the sixth time in seven seasons that Wisconsin has placed a tight end on the Mackey Award watch list. Including Pedersen’s nod for the Badgers, seven Big Ten schools are represented on this year’s Mackey Award watch list. The term “most outstanding” is a familiar one for Pedersen, who collected first-team All-Big Ten laurels and was named Kwalick-Clark Big Ten Tight End of the Year last season. He tallied 27 receptions for 355 yards — an average of 13.1 yards per catch — and scored four touchdowns on the season. Pedersen had similar yardage numbers but hauled in eight touchdown receptions in 2011, earning him recognition as Wisconsin’s third-ever Mackey Award semifinalist. He went on to earn second-team All-Big Ten honors. With 14 career touchdown receptions, Pedersen enters 2013 needing just one TD grab to match Pat Richter and Lee DeRamus for the ninth-most in UW history (15). A midseason watch list for the Mackey Award will be announced on Oct. 14, with the announcement of semifinalist set for Nov. 18 and the finalists to be revealed on Nov. 25. The 12th edition of the Mackey Award will be presented Dec. 12 during The Home Depot College Football Awards Red Carpet Show on ESPNU. The Mackey Award is named in honor of Pro Football Hall of Famer John Mackey, who won Super Bowl V with the Baltimore Colts and was a five-time Pro Bowl selection between 1963 and 1968. MADISON, Wis. — Senior leaders on both sides of the ball represent Wisconsin on preseason watch lists announced Monday for a pair of major awards. Senior RB James White was named to the watch list for the Maxwell Award, presented annually to the national player of the year, while senior LB Chris Borland is a preseason candidate for the Bednarik Award, which is given to the nation’s top defensive player. Both lists were announced Monday by the Maxwell Football Club. White enters his senior season as the nation’s second-leading rusher among active running backs, owning 2,571 career rushing yards despite making only two starts in his first three seasons at UW. He is the lone active running back in the FBS to boast a career rushing average of better than six yards per carry with his school-record mark of 6.09 yards per attempt. A 1,000-yard rusher as a freshman in 2010 (1,052), White has nine career 100-yard games to his credit and enters the season ranked 12th in UW history with his 2,571 career yards. He played in all 14 games for Wisconsin last season, rushing for 806 yards — an average of 6.4 per carry — and finishing with 12 touchdowns. He ran for 119 yards and scored four touchdowns — while throwing for another TD — in UW’s 70-31 win over Nebraska in the 2012 Big Ten Football Championship Game. Borland, featured on the Bednarik watch list for the second-straight season, heads into his final year at UW as a centerpiece of the Badgers’ defense. A first-team All-Big Ten pick each of the last two seasons, Borland has proven himself a play-maker as an inside linebacker. With 13 forced fumbles in his career, he needs just one to match the Big Ten record and all-time FBS best of 14. One of those forced fumbles came in the 2012 Big Ten Football Championship Game, with Borland also posting a season-high 13 tackles as the Badgers secured their third-consecutive conference title. He then led the Badgers with nine stops in the Rose Bowl vs. Stanford. Borland has 13 sacks and 41.5 tackles for loss — tied for seventh-best in school history — to his credit and begins his senior season ranked 19th all-time at UW with 308 total tackles. The Maxwell Award, named in honor of Robert “Tiny” Maxwell, is in its 77th year. The Bednarik Award, honoring Hall of Famer Chuck Bednarik, will be presented for the 19th time. Ball is one of 28 running backs named the Maxwell Award watch list, which includes a total of nine Big Ten players. Borland is one of 10 players to represent the Big Ten on the Bednarik Award watch list. Notre Dame LB Manti Te’o won both the Maxwell Award and Bednarik Award last season.